Carefully cook the Arborio rice until al dente, so it retains a firm, creamy texture. This is a comforting, hearty Italian recipe loosely based on several by Mario Batali and Ina Garten. You’ll note that in my version, the process and ingredients are simplified. This recipe makes a wonderful side dish. It can also be served as a main course meal with a nice, crusty Italian bread and butter or XV olive oil for dipping. 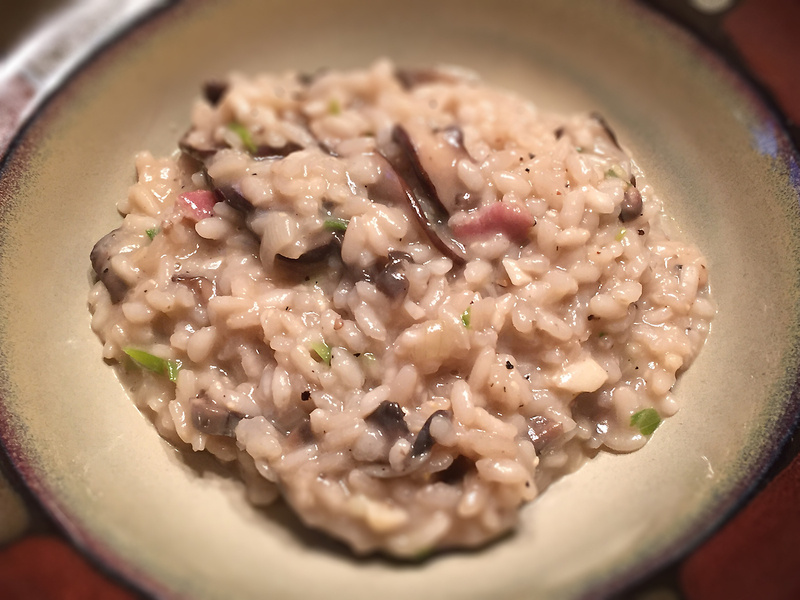 You don’t need to constantly stir the risotto in order for it to turn out correctly. Enjoy! Kosher salt to taste, about 1 tsp. In a heavy saucepan, heat the chicken stock until simmering. In a large, heavy, 5-qt. cast-iron Dutch oven, heat the olive oil over medium heat, and add the diced bacon. Saute for two minutes until the fat starts to render out. Add 2 tbs. of the butter, the onion, garlic and mushrooms and continue to saute, until the onion is translucent, about five to seven minutes. Do not carmelize the onion or scorch the garlic. Add the rice to the pan and stir to coat. Continue to stir for two minutes until the rice is very lightly toasted. Reduce heat on the Dutch oven to medium-low. Add the white wine, salt and pepper and continue to cook until reduced. Next add six ounces of the heated chicken stock to the rice and stir occasionally until most of the liquid has evaporated. Continue to add stock in six-ounce increments, stirring occasionally, and cook for at least 25 minutes. At this point the rice should be cooked al dente and appear creamy. Remove the Dutch oven from the heat and add the remaining butter, parsley or chives, the basil and the 1/2 cup of grated Parmesan cheese. Mix well to incorporate. Serve immediately in large bowls with more grated Parmesan cheese on top, as a garnish. 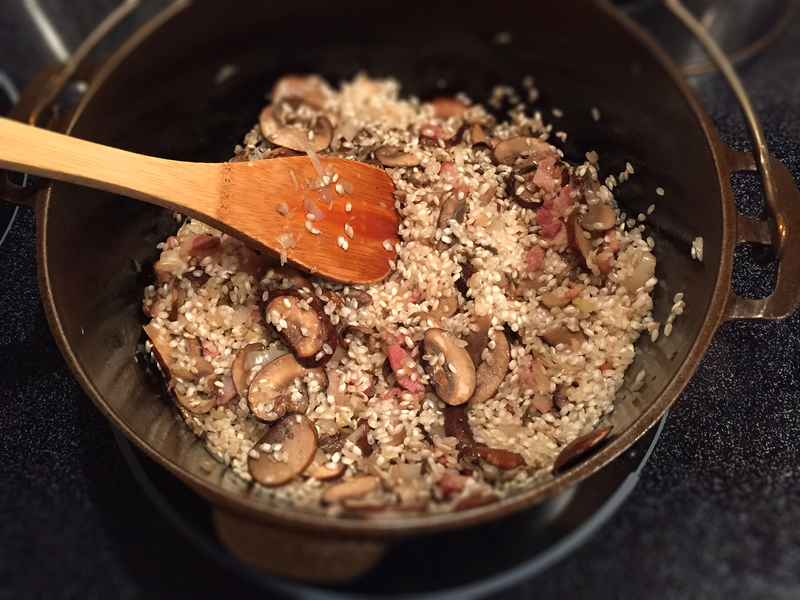 Adding the Arborio rice to the mushrooms, onion, garlic and bacon. 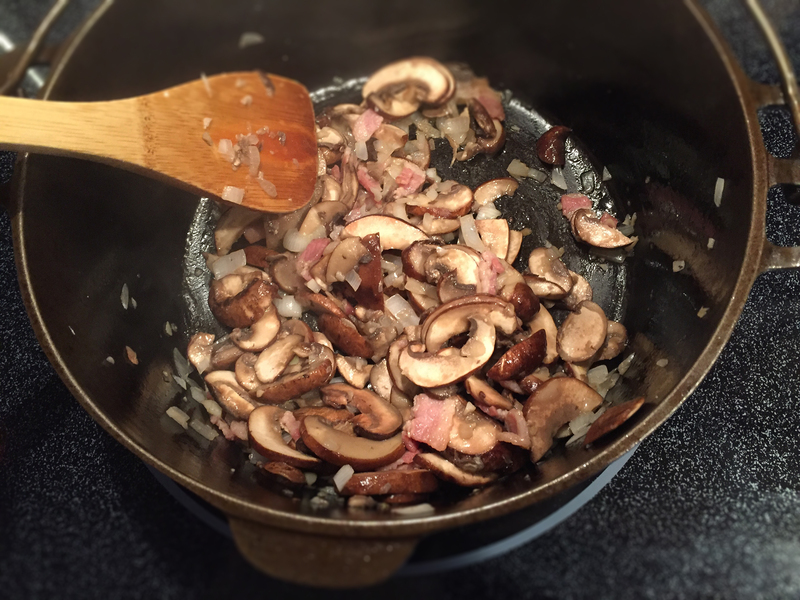 Sauteing the mushrooms, garlic and onion and bacon. This is a super-simple side dish that only takes a few minutes to prepare and is very inexpensive. Pair it with grilled chicken, pork or salmon. Use real butter or it will not turn out. In a sauté pan, fry the minced onion and diced carrot in butter over medium heat until tender, but not carmelized. Remove and put aside. In a covered saucepan, bring the water and reserved liquid from the mushroom to a rolling boil, then add the chicken base, parsley, mushrooms, sautéed onion, carrot and the rice. Season to taste with black pepper. Stir, remove from heat and let stand covered for five minutes until the liquid is absorbed and the rice is tender but not overcooked. Before serving, add the scallion and gently fold in. This savory recipe is from Emeril Lagasse. I’ve made it many times and my kids love it. The sauce is what sets this dish apart. Season the chicken generously with 2 tbs. Essence. Add the other tablespoon of the Essence to the cup of flour. Place the flour in a 1-gallon plastic bag and add the chicken to the bag. Shake the bag well to thoroughly coat the chicken with the flour. Remove the chicken from the bag and place on a plate to dry. Reserve the flour. Heat the 1/2 cup of oil in a large iron skillet or Dutch oven to 320 degrees F. Brown the chicken in two batches, cooking 4 minutes on each side. Reserve the chicken on a clean plate lined with paper towel. Reduce the heat to medium. Add the onion, pepper and celery to the hot oil and cook covered, 5 minutes. Stir occasionally to prevent sticking. Add the garlic and thyme and cook for 1 minute. Add 3 tbs. of the reserved flour to the pan and stir well. If the vegetables still have an oily appearance, add up to 2 tbs. more flour. Cook for 3 minutes and stir to prevent burning. Add the beer and cook for 2 minutes. Add the bay leaves and chicken stock and bring to a low simmer. Return the chicken to the pan and cover, simmering on low for 30 minutes or until the chicken begins to pull away from the bone and the sauce is reduced. Using a slotted spoon, place the chicken in a serving dish. Sprinkle with chopped parsley and serve immediately over steamed rice. The sauce should be very thick. If you need more stock, do not add more than two additional cups. Tabasco is a great all-American brand — which makes this Asian-inspired recipe even better. In a small bowl combine the soy sauce, 1 tsp. sesame oil, garlic, ginger and 2 tsp. Tabasco sauce. Mix well, stir in shrimp and set aside. In another bowl, beat eggs with 1/4 tsp. salt, remaining 1 tsp. sesame oil and 1 tsp. Tabasco sauce. Heat wok or large skillet until hot; add 1 tbs. oil. When hot add the shrimp mixture. Stir-fry 3-4 minutes until shrimp is done. Remove from wok and set aside. Add another tbs. oil to wok and when hot, add onion. Stir-fry for 1-2 minutes and remove. Heat the remaining 1 tbs. oil in wok; add egg mixture. Stir fry for 1 minute. Add cold rice and stir-fry for 3-4 minutes. Add shrimp, onion, bean sprouts, peas, remaining 3/4 tsp. salt and pepper, cook for 2 minutes. Serve immediately. I was messing around one afternoon and came up with this recipe. The perfect side with a pork roast. In a 2.5 quart dutch oven, bring the beef stock to a boil. Add the rice, reduce the heat and simmer for 20-25 minutes, covered. While the rice is cooking, in a heavy skillet saute the mushrooms and garlic in a bit of olive oil. Add the chopped scallion. Sautee until just tender. Do not overcook. Combine the mushrooms, scallion and garlic with the rice, heat through covered for another ten minutes and serve. This is an easy version of Red Beans & Rice that goes well with a number of main dishes like ribs, chicken and even steak. Make it as hot as you’d like. The chimayo controls the heat. Saute the onions and bacon in a large skillet until slightly browned. You may want to start the bacon first. Place in a 5-quart cast-iron dutch oven on medium heat. Add broth and stewed tomatoes. Crush the tomatoes on the bottom of the pot with a masher. Add spices and simmer for 15 minutes, covered. Add beans and simmer for 5 minutes. Add dry rice and cover. Stir once and reduce heat to absolute minimum. Cook for 15 minutes more. Fluff and serve with Tabasco on the side. This is a great recipe for busy folks who don’t have a lot of time during the work week to prepare a dinner. You’ll earn the Silver Star if you throw the chicken on the grill. Both versions are superb. Marinate the chicken breasts in lemon juice, garlic and curry powder, using a sealed plastic food storage bag for at least three hours. In a 2-1/2 quart stock pot or Dutch oven, bring chicken stock to a boil, add the rice and simmer for twenty minutes. While the rice is simmering, brown the chicken breasts in a skillet with 1 tbs. olive oil. Let sit for five minutes and slice in 1/2″ strips and add to the dutch oven with the scallion and parsley until just warmed through. Top with lime juice and serve.